Cells use different signals to react to stress and to inform other body cells. Triggers are, for example, cancer or inflammatory diseases. A central signaling pathway of stress response is the modification of proteins called ADP-ribosylation. 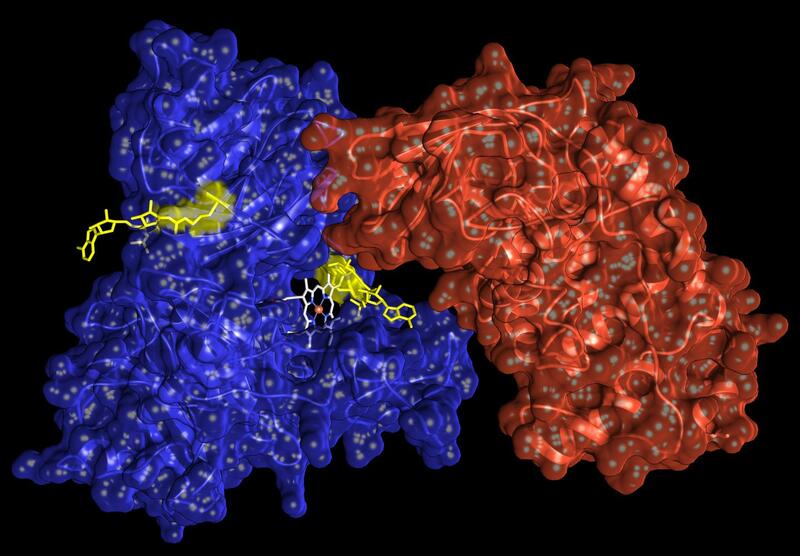 Small molecules (ADP ribose) are added to precisely defined protein sites to control protein function. Researchers at the Department of Molecular Mechanisms of Disease at the University of Zurich (UZH) have recently developed a method with which they can, for the first time, use tissue samples to investigate all proteins outside the cells that carry ADP-ribosylation as modification. With the identification of this ADP-ribosylome, the exact positions at which the proteins were modified can also be determined. These data allow conclusions to be drawn about activated signaling pathways in the cells. Specifically, the scientists investigated cells in the muscle tissue of mice. The enzyme ARTC1, which exclusively modifies proteins that are located outside the cells, is almost only found in this type of tissue. It was surprising that even in the absence of stress many of the extracellular muscle proteins already showed the modification. In the interior of the cell, however, ADP-ribosylation is only triggered in stress situations. "This suggests that ADP-ribosylation is involved in many signaling pathways in an as yet unknown way and has several ways of controlling cell function," says Mario Leutert, first author of the paper. The scientists suspect that these protein modifications are also involved in disease processes. Substances that block ADP-ribosylation act against certain forms of breast and ovarian cancer and can reduce inflammation. Since the changes in all proteins in a tissue sample can now be investigated at once, the modifications at selected protein positions can be investigated in healthy and sick individuals. Modified ADP-ribosylation patterns indicate a disease and allow conclusions to be drawn about therapeutic strategies. Michael Hottiger's group has also developed the first antibody that recognizes a mono-ADP-ribosylated protein. "Initial results in collaboration with the University Hospital Zurich (USZ) show that such antibodies could be used to predict the course of certain types of cancer," says Hottiger. The researchers are currently developing additional antibodies against selected ADP-ribosylation sites that were discovered in the new study. They also want to investigate whether such antibodies also have therapeutic potential – for example, against cancer. "We still have a lot to learn about ADP-ribosylation. But we are convinced that the medical benefits for cancer, infections and neurodegenerative diseases might be enormous," concludes Hottiger.